Clarifying Microsoft Software Asset Management (SAM) vs. Audit. Learn about Microsoft license compliance verification (commonly known as "audit") from the new #SAMTalks video. See official FAQ at https://aka.ms/msauditfaq. Want to watch other #SAMTalks videos? Subscribe to Microsoft Partner Network YouTube SAM Channel at https://aka.ms/sampartnervideos. Clarifying Microsoft Software Asset Management vs. Audit. 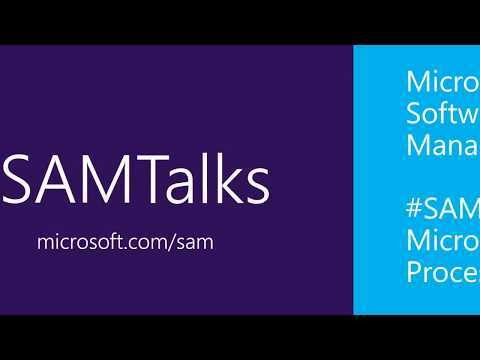 Learn about Microsoft license compliance verification (commonly known as "audit") from the new #SAMTalks video. See official FAQ at https://aka.ms/msauditfaq. Great video. Already shared it on Linkedin and I want to encourage every SAM enthoustiast who hasn't done so yet to share it soon. It definately not only help the community, but educating our customers too. Great insight on clarifying Microsoft 's Audit Process and Microsoft license compliance verification. The Software Asset Management by dedicated partners will in fact be a more and more important and crucial field with the upcoming of Cloud Computing and business everywhere. It represents a great opportunity for both partners and customers. Worth noting is that SAM Partners can be wonderful partners to SIs (and also to other partner types). SAM Partners gain excellent insights in the accounts that they're auditing and are trusted advisors for what needs to be done. In the era of cybersecurity threats there are often vulnerabilities discovered that needs to be taken care of. But there are also other insights that will benefit the customer if they are addressed by skilled partners. So my appeal to SIs and SAMs are to invest time and discover how to drive business together - I know that the opportunities are great and I also know that this is somewhat under-utilized. And don't forget to tell us about the success that you have together! Thanks for sharing Per. I think not only SI's are interesting for teaming with SAM partners, also MSP's and CSP's could benefit from great insights in customers environments. We have made good succes teaming with those partners too. Agree 100% with you Peter! MSPs and CSPs are also a great fit for SAMs! Lot of opportunities here whjen different partner types work together bring the best of their knowledge and offerings to their customers!